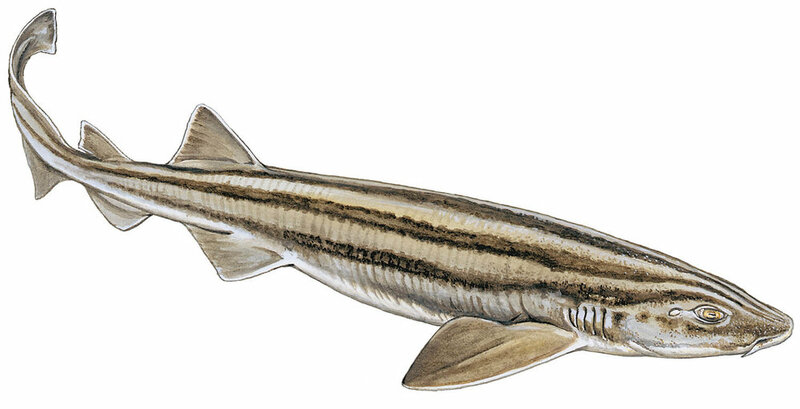 A small shark with unmistakable combination of striking longitudinal stripes, but no spots. It has prominent but short nasal barbels and dorsal fins (second one being much smaller), which are set very far back on their body. The shark hatches at a length of 5.51 to 5.9 inches [14 to 15 cm]. Males mature at 1.9 to 2.5 ft [58 to 76 cm] in length, and females mature at 2.1 to 2.4 ft [65 to 72 cm]. Its maximum length is 3.1 ft [95 cm]. They enjoy the continental shelf to the upper slope, from the surf line and intertidal to 925.2 ft [282 m] deep. They are usually on or near the bottom in rocky areas, and often in caves. These sharks are in the southeast Atlantic and western Indian Oceans. They are apparently endemic to South Africa (both Capes, rarely to KwaZulu-Natal). There are records from Zaire, Madagascar, and Mauritius, but they require verification. Prey – Bony fish, hagfish, other small sharks, shark eggcases, and a wide range of invertebrates. Reproduction – Oviparous, and lay pairs of eggcases (one/oviduct). One hatched in an aquarium after about 5.5 months. They are usually nocturnal, but sometimes active during the day. Hardy in captivity, and are taken by trawlers and anglers.